- Feb. 22, 1944-Mar. 2, 1944. - Also issued on microfilm from the Library of Congress Photoduplication Service. The Tule Lake WRA Center information bulletin . Newell, Calif., March 2. (Newell, CA), Mar. 2 1944. https://0-www.loc.gov.oasys.lib.oxy.edu/item/sn84020533/1944-03-02/ed-1/. 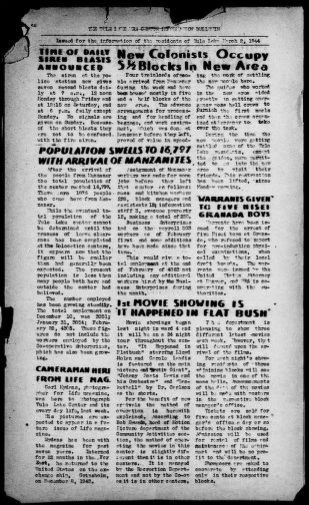 (1944, March 2) The Tule Lake WRA Center information bulletin . Newell, Calif., March 2. Retrieved from the Library of Congress, https://0-www.loc.gov.oasys.lib.oxy.edu/item/sn84020533/1944-03-02/ed-1/. The Tule Lake WRA Center information bulletin . Newell, Calif., March 2. (Newell, CA) 2 Mar. 1944. Retrieved from the Library of Congress, www.loc.gov/item/sn84020533/1944-03-02/ed-1/.